I want to use a harbor freight or similar solar panel to power a fan that will move air from a solar heat collector to my house. I was going to avoid the use of batteries if possible. The fan is a Rule 240 bilge blower which is 12v and draws max of 4.3 amps. The Harbor Freight solar panel kit is 12v, 45 watts and 3 amps. Of course with lower levels of sun the performance would be below those levels. Can I connect the panel directly to the blower? If the voltage drops too low will that damage the motor? Do I need some sort of voltage controller? Probably not--The typical brushed motor is pretty voltage tolerant. Go ahead and connect--measure the fan voltage and see if it is OK. It is very possible though, that you will need a larger solar panel to start the fan and run it under less than full sun... The "proper" way to run a blower is with a Linear Current Booster (more or less the MPPT of the battery less DC world). But, they are not cheap... It may cost less to just buy a second solar panel and connect it up. If the motor needs a max of 4.3 amps, and the Harbor Freight panels can only supply 3 amps.. The motor isn't going to work real well. You need more PV power. I've got some panels that work well with a 12v battery charger..
Notice at max power, they put out 17.4 volts. And with a light load, they put out 22 volts. Not really good for connecting directly to electronics that require 12vdc.. Simple solution.. Use off-the-shelf hardware. Start with a 50 to 70 watt PV panel. when the battery voltage drops under ~10 or 11 volts..
Hook it up and it will keep the fan going, even when a cloud comes over.. It may not work all that well, but it won't hurt the motor. Folks run DC water pumps directly off solar modules all the time. How much water the pumps move is dictated by the intensity of the sunlight on the module(s). Thanks BB for the mention. I'll bet it'll work. Just won't spin full speed since the load is higher than the panels can supply. I've connected brushed, and brushless, 12V fans directly to solar panels for a while now. While they spin full speed in full sun, the amount of sunlight varies throughout the day. Morning, evening, clouds, etc. I could stand in the garage and hear the audible speed changes as clouds would pass by. That said, this audible speeding up/slowing down, might get a bit annoying if you're near the fan. Try it for now, you can always add more panels later... along with batteries, charge controller, blah blah. It gets addicitive, be warned! Solar powered attic fans do exactly this. To make that work, you must not use the hotwater heater's temperature controls. The DC voltage Arc will blast the contacts..
(I killed mine with about 120 volts of DC from 4 panels). So, you must make sure your hot-water over-pressure over-heat plumbing is good.. I use water everyday, so I rarely get really hot water (over 160F).. But for vacation I shut off the PV outside, and unplug the panels. I have a home-control system that monitors tank temperatures, and can email me if things start to look over-heated.. I use panels in series to get higher voltage, into the 13 ohm resistance of the heating elements, to draw full current. I have 2 arrays, 600w on one heater and 500w on the second heater element.. If you connected your 13 ohm elements in parallel, that would present a load of about 6.5 Ohms.. 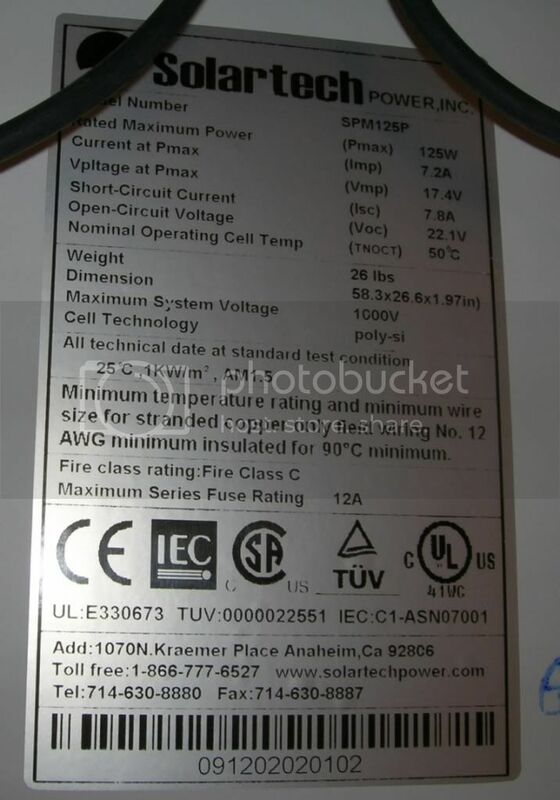 If your 225w panel makes 37 volts.... 37 / 6.5 =5.7 amps.. Is just about a perfect match.. In full sun, you will get about 210 watts of power.. That's about 700 BTUs. It will be pretty much impossible for the water heater to harm the panel.. Since it can drive a dead-short, only to it's full rating.. If you decide to use a fuse for some reason. Use at least 10A, so it doesn't pop when you get cloud-effect.. If you decided sell your panel and use your 230vac hotwater tank with 120Vac with the built-in temperature controls! 120/13= 9.2 Amps or 1,108 watts. (3,780 BTUh) This will supply you will more hotwater than one panel, and you would not have to worry about over-heating etc.. This type of heating connection is simple to rig.. Just get some AC cord and 120vac plug rated for 15-20 amps.. Connect it where the 240vac lines would go.. Simple stuff. What's nice about using 120vac, is that you can remote control your water heater with an X-10 appliance module.. I use a small heat-pump on top of my water heater.. It's on an X-10 and a timer.. I don't like it running at night.. If it's a sunny day, I use the X10 to allow the solar pv to provide the BTUs.. It's nice to have the 120AC as a backup.. When the sun don't shine.. This is my rig now.. But I lost one of my 200w panels to a fallen limb.. Now it's 600W.. But, 3 panels are still doing a pretty good job. Yeah, last year was mild too. El Nino has been very good to the NE again.. I looked at the heat map, and El Nino looks even larger this year. But, around this time last year, it got super cold (mini-splits failed) and the snow got super deep..
Luckily for us, it was mostly light weight snow.. But still, many roofs fell in.. I hope it's not as cold this winter! That was brutal.. We had to use space heaters and burn oil on the bad days..
My Airforce meteorologist source says no worries for you. He promises! He has already filled my 16,000 gallon tank by New Years! You only would put 106 watts per hour into the water heater if you hook up only 1 heat element and use your one solar panel. It would push about 2.8 amps DC with that one panel and one heat element hooked to it. "If you connected your 13 ohm elements in parallel, that would present a load of about 6.5 Ohms.. In full sun, you will get about 210 watts of power.. That's about 700 BTUs. " Still might not get a lot of hot water with 6.5 Ohms, but warm water is better than cold.. Which was given by some unnamed forecasters as a Sign From Above that fools living in the NE would be hammered..
And guess what happened to Siberia again this fall..?. "An early analysis of October snowfall in Siberia—which historically shows a link to how cold it gets during the winter in the Eastern U.S.—argues for pretty much the same thing: lots of snow." That was then, this is now.. I hope it's not going to be fatal this time..
Let me be the first to welcome our new Alien masters.?. Well, the sun is out, and the hot water tanks is up to 117.6 F and that means it's time for my Sunday morning shower..
1 hour later, after a long hot shower.. 122.9 F ?? And the heat pump has stayed off.. Sweet Solar! I had the same fan in the bilge of my sail boat and it ran on a 32watt flex panel year round when the sun was out . I have the same rule fan on my battery box now for venting .